In Aldi’s snack food aisle, amid the off-brand Doritos and off-brand Cheetos, the lineup includes some slightly healthier options. There are the Green Pea Crisps Baked Pea Snacks (my favorite) and an array of dried fruit (my kids’ favorites). 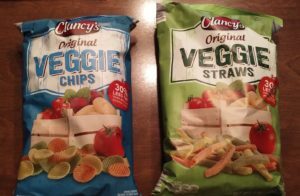 Today, we’re looking at Clancy’s Original Veggie Chips and Clancy’s Original Veggie Straws. These are a potato-based, chip-type snack that claim to have 30% less fat than regular potato chips. The veggie chips are small, rippled circles no more than an inch or two in diameter, and they range in color from light yellow to light orange to light green. The package doesn’t indicate whether these are baked or fried, but I’m guessing they are baked or prepared in a similar way that is healthier than frying. The ingredients list is straightforward: potato flour (potato flakes, potato starch), sunflower and/or safflower oil, tomato puree, spinach powder, salt, sugar, turmeric, and beet powder. In keeping with Aldi’s commitment to remove artificial dyes from its store brands, these veggie chips get their color from vegetables. They taste fine and are similar to a baked potato chip, with a light hint of salt. These potato-based snacks seem to be identical in taste compared to the veggie chips. These are straw-shaped snacks that are approximately two to three inches long. They have the same light yellow, light orange, and light green colors. Other than the addition of cornstarch, the ingredients list for veggie straws is the same as the veggie chips: potato flour (potato flakes, potato starch), sunflower and/or safflower oil, cornstarch, tomato puree, spinach powder, salt, sugar, turmeric, and beet powder. The veggie straws also claim to have 30% less fat than regular potato chips, and I prefer the veggie straws over the veggie chips simply because of the fun shape. My kids like both the chips and the straws. Clancy’s Original Veggie Chips and Clancy’s Original Veggie Straws are not true health foods, but they are a good alternative to greasy potato chips, and they are free of artificial colors. Recommended. Where can I get or order veggie straws? They’re a Regular Buy so they should be at your local Aldi. Stop by Aldi every week. Have not found Clancy veggie straws but one week. How can they be a regular item. I don’t think so. Aldi sometimes shifts products from Regular Buy to Special Buy, or the other way around, and what is a Regular Buy in one area may be a Special Buy in another. Clancy’s veggie straws are not bad, however, the packaging for all Clancy’s products are not worth the price we pay for anything Clancy’s. Bags rip easily and therefore, the product gets exposed to air and it grows stale quickly, meaning they want you to go out and buy more. I stopped buying anything with Clancy’s until they stop ripping off us customers. Hi Everyone. I love the Clancy’s original veggie straws. What I don’t like is, when you go to wash your hands. it smells like you just ate two orders a large french fries at a fast food restaurant!!! I wrote numerous times about Clancy’s bags. They are the worst. They rip, they do not fold up easily and Aldi’s is like all the other rip off stores, they want you to buy more so they do NOT listen to thecustomers. I stopped buying Aldi’s products because they are not consumer friendly…. You are soooo wrong. I’m sitting here eating Clancy Veggie chips, the bag is intact and has been opened and folded several times. I suggest that you go other places to shop cause I’m sure they will be so much better!! These chips dont have animal ingredients/products in it right?anyone know? The bag says cooked with sunflower and safflower oils. Have you tried to open them with a pair of scissors, fold and clip when you are through? Soooo easy!!! stop putting so many yellow ones (my childs least favorite) most bad is just the yellow ones.